This picture is perplexing on a number of levels. First, there is the quotation aspect. Is it indeed beef that is in this dish, or is it "beef"? And if the latter, then what exactly are people putting into their mouths? But perhaps even more disturbing is the very concoction itself. 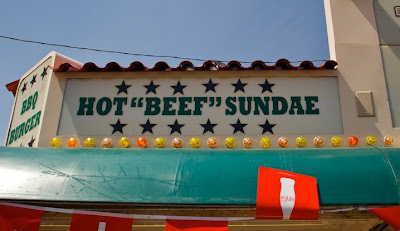 What exactly is a "hot beef sundae" (or "hot 'beef' sundae")? This kind of sundae sounds like something that a convict would "serve up" to you in prison. I don't even what to think about the whipped topping. It's sliced beef, topped with mashed potatoes, gravy over that and a cherry tomato on top. Sadly, I know this...oh, it's about $7 because it is sold at State Fairs, where you are a prisoner to either this or fried something on a stick.